Here are six stories by one of Iran’s greatest contemporary writers, rare and intimate glimpses into the lives of ordinary Iranian men and women; windows into the Persian soul. From the delicately painted tragedy of Mehrangiz in A City Like Paradise to the wry comedy of Anis, from two sisters’ surreal nocturne in Childbirth to a village boy’s broken dreams in Potshards, from a young woman torn between duty and passion in Bibi Shahrbanu to the brilliant and numinous Sutra, each story is told with the detail, clarity of vision, and deeply human compassion characteristic of Daneshvar’s finest work. Daneshvar’s Iran is a landscape in which the medieval and the modern coexist uneasily. Against this backdrop, the author explores the persistent themes of her nearly five decades as a writer: themes of sexual and racial identity, the social relations of wealth and poverty, the workings of memory and dreams. 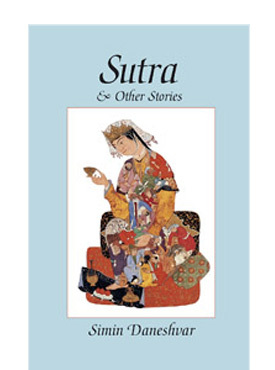 The lives of her characters-here, some of her most subtly realized-are determined by conditions and norms over which they have little or no control; still, in the end, Sutra offers a vision of hope. These stories are a major addition to Daneshvar’s works in translation, Daneshvar’s Playhouse and Savushun. These six vibrant stories by Iranian novelist Daneshvar (Savushun) chronicle the vicissitudes of life&shyp;its horror, unfairness, humor and fleeting beauty. There is the domestic tragedy of “A City Like Paradise,” which tells of a black servant cudgeled and thrown out by her employer, who is jealous of her bonds with household members; the tart comedy of “Anis,” about a woman who, as she shuttles from one husband to the next, swings from subservience to fervid religiosity to urbane sophistication; the social commentary of “Potshards,” describing a patronizing, elderly white women’s impromptu attempt to adopt a village orphan. Born in 1921, Daneshvar portrays a world full of injustices and cruel surprises redeemed by hope and acts of kindness, such as a midwife’s clandestine visit to save the life of an ungrateful pregnant woman (“Childbirth”). In the exuberant, virtuoso title story, a sea captain born in Madras, shipwrecked off Africa, recalls his smuggling exploits, his life in the Persian Gulf and the wife and daughter he forced into prostitution and then abandoned; half-delirious, he undergoes an exorcism to free himself of possession by a mermaid and then dictates his vision of a world free from tyranny and sorrow. There are few translations into English of Iranian Simin Daneshvar, a writer for nearly five decades. Her Sutra & Other Stories allows the reader to peer into the extraordinary lives of ordinary people living in Iran. Each of the six tales has a folkloric tone, but their strength lies in presenting the woman’s point of view, the infrastructure of interpersonal bonds that still operates in the face of rapid change. Neither preachy, nor judgmental, the stories often contain a universal message. In “Potshards,” an impoverished boy chooses to remain with his invalid brother rather than move to Tehran to be adopted by a wealthy woman. “Childbirth” reveals the negative influences of poverty and the military as well as the positive side of duty and the sacredness of new life. Difficult circumstances bring people into contact with purpose, wisdom, and the ever-present veil. Mage Publishers must be lauded for its decision to make more of Simin Daneshvar’s works available to the Englishspeaking world. Sutra follows the publication of Daneshvar’s Playhouse in 1989 (see WLT 64:4, p. 690) and Savushun in 1990. The absence of an introduction or a glossary of terms in the most recent volume of Daneshvar’s short stories signals the safe assumption on the part of the publishers that the marketplace or audience to which Sutra is targeted no longer needs to be helped with untranslated and untranslatable terms. Those who read Daneshvar in English, it would seem, have gained enough familiarity with the social and cultural setting of her works to proceed directly to the stories. Perhaps this decision on the part of the publishers could have been more emphatically conveyed to the translators, who, out of habit, have retained some italicized and untranslated Persian words one would normally expect to look up in a glossary of terms. The decision to do without the usual introduction and glossary is a refreshing turn away from a preoccupation with the linguistic and cultural overtones of the original text. The reader can enter the fictional world with fewer impediments. If we can read Flaubert’s Madame Bovary without a glossary indicating exactly what kind of French bread Charles and Emma had in the famous dinner scene that has been so often cited and analyzed, then we should also be able to read a Persian writer’s work without worrying that characters in a story are eating lavash bread. Readers who do not know what lavash looks and tastes like will in any event not learn anything from the allusion and will no doubt be distracted by it. This particular obsession with cultural specificity stands out in a translation that otherwise reads so well, since the translators’ remarkable use of idiomatic English and felicitous turns of phrase makes one eager for an even smoother translation. It is their success in conveying the mood and tone of the six stories in this collection that prompts the reader to want to be even more deeply steeped in a seamless fictional world. The stories themselves take us into the innermost thoughts of characters often tragically caught between harsh realities with which they must contend and pleasant dreams they have little hope of seeing realized. Now and then we glimpse traces of Daneshvar’s persistent social critique and personal hopes for the future. One of the final passages of “Sutra,” for instance, reads like a political manifesto: “A day will come when certainties will freely translate into action. Tyrants will be withheld from tyranny . . . . Such a world will come.” When seen in the context of the adverse world in which Daneshvar situates her fictional creations, the simplicity and sincerity of such utterances become fully comprehensible. It is this very simplicity that attracts readers, be they inside or outside her own cultural milieu. Here are six stories by one commonly regarded as the preeminent Iranian woman writer of recent decades. She is unusual in not speaking for a “cause,” or from dissidence or exile, dreaming of (or mocking) an Iran that was, or never was, or might yet be; rather she speaks in a sort of organic oneness with her own people’s ongoing life process as it unfolds in only glancing contact with the worlds of politics, economics, and social and technological change. At least one of the six stories (“A City Like Paradise”) has been rendered into English once before, but a second version can always prove useful and even satisfying in its own right. The tales vary in length from seventeen to forty-seven pages, differing also in theme and setting and treatment. What closely unites them is a pervading atmosphere of “magic realism” and an enigmatic obliqueness of vision. None of them is in the least realistic or naturalistic in the traditional senses of those terms; none of them offers anything like a straightforward narrative of events; none of them confronts its matter (or the reader) face-on; and none imposes authorial comment, much less moralizing. Matthew Arnold’s prescriptive formulas of sweetness, light, steadiness and wholeness, and the rest have absolutely no application here. If the first (“Potshards”) and the fourth (“Childbirth”) stories are those most firmly grounded in recognizable everyday worlds, the last and eponymous one (“Sutra”) presents a veritable tour de force fusion of actuality, fantasy, and mystical transport. Significantly, its title is not Islamic or even Persian, but a Sanskrit term, and one carrying overtones of both Hinduism and Buddhism that well accord with the ecstatic and widely ecumenical utterance at the end (pp. 187-88). This much said, it is clearly to little purpose to “summarize” each story, but their settings deserve to be briefly indicated. “Potshards” is based on a village boy’s encounter with Western archeologists. It is the lightest of the six, treating ironically the widely disparate appraisals and expectations of the two parties. (This is indeed a very Persian story, difficult to conceive in a milieu like Egypt, with that country’s long, intimate, and sophisticated interaction with Western archeologists.) “A City Like Paradise” turns on the tragic, gallant life and death of a black female servant, virtually a slave, within an ordinary Persian family circle. Again, “Anis” arises out of a (much looser) mistress-servant relationship, but presents some unexpected twists and turns and reverses of social comedy. “Childbirth” confronts a woman possessing modern midwifery skills and a high sense of duty (she may actually be a nurse, but performs more or less as a doctor) with superstitious, inhospitable, resentful, and greedy villagers, living on the very outskirts of Shiraz. “Bibi Shahrbanu,” with a family taking part in a mass pilgrimage to a famous shrine, offers devastating, if empathetic, insights into the rituals and hopes and fears surrounding marriage and fertility among simple and even would-be sophisticated people. Here, fantasy and irony are again much in evidence. “Sutra” itself is notionally related by the luckless and somewhat low-principled owner of a small trading craft, currently in prison but normally plying the Gulf and the Indian Ocean, who dallies (in dream or reality?) with both his own boatboy and a mermaid. The climax, as suggested earlier, reveals Daneshvar at her most gifted, as an innovative writer of the highest order in the long history of Persian literature. All of these stories, in their more mundane aspects, unfold in a commonplace setting of casual, random cruelty (psychological as well as physical) interspersed with kindness and sentimentality; and in several cases the opposed manifestations proceed from the same individual. It is never made clear whether this represents a particular cultural phenomenon or is to be taken as part of the general human condition. In any case, the abrupt transitions and interchanges always demand careful reflection on the part of the reader who aspires to grasp the “inwardness” of a remark or an action. Many passages are (appropriately enough) gloomy, even grim, quite at variance with the impression given by the notice on the dust jacket of a prevailing atmosphere of gentleness, innocence, wonder and hope. All this being so, and given the other characteristics of Daneshvar’s writing referred to earlier, it is unfortunate that the translation tends to enhance the general, purposive opaqueness by its own total lack of comment or even the most unobtrusive interpretation. This is in no way to suggest that the text should be “improved” in translation or burdened with inappropriate annotation. However, although those familiar with Iranian social norms and speech modes will usually realize what is going forward, for others the enigmatic attraction of the tales themselves might well be overlaid with further mysteries that are at once gratuitous and disconcerting. The translation as such is nearly always smooth and elegant, with only occasional infelicities or faults of “register.” For instance, the waiter in a humble village chaikhana is oddly described as a “busboy”; the archeologist intruders in the village are repeatedly referred to as “travelers” (presumably a literalism from the source language), when something like “migrants/birds of passage/wayfarers/visitors/transients” might be more appropriate and less confusing in English; and a European woman’s unattractive complexion is said to be “tawny,” when what is surely meant is not “like a lion’s skin” but “swarthy.” The title “Potshards” should read “Potsherds,” irrespective of pronunciation: “-a-” is found only in the word “shards” itself. Finally, in this select list, to characterize the ta’ziya as “religious opera” is at best clumsy and misleading and at worst liable to give more offense than the older term “passion play,” sometimes deprecated for its Christian overtones. The technical production of the book is immaculate, as one has come to expect with Mage Publishers. Hasan Javadi was born in 1938 in Tabriz, Iran. He received his Ph.D. in English Literature from Cambridge University in 1964 and has taught in Iran and America since. His books include Satire in Persian Literature (1988) and Persian Influence on English Literature (1983). He has translated many books and stories from Persian into English, including Gholam Hosayn Sa’edi’s Dandil: Stories from Iranian Life (Random House, 1981).